Searching online for C-Arm prices? You found them! Search no more; we have prices listed for the most popular C- Arms on our new 2018 Info-graphic. As a leader in refurbished and used C-Arms we want to help you with C-Arm questions and identify the best solution at the appropriate price. This is not a one size fits all product. How you plan on using your C-Arm will determine what model will fit your needs. In addition to budget, you will need to know exactly what studies will be done at your facility. Why the different Price Variations? These prices listed are close estimates to the prices on the market today. 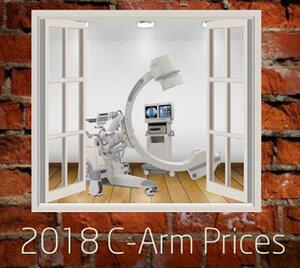 The factors that determine the prices are the year the C-arm was manufactured, the condition (Refurbished to OEM standards) or just used, the applications that come with the C-Arm and warranty included when purchasing your C-arm. Our C-Arm Expert at Atlantis Worldwide Alex Silbergleit will gladly answer any questions and give you a firm quote with the options that you specify. If you need guidance in learning your options he will also help you determine the best fit for your facility. Contact Us Today for Your C-Arm Needs!